Royal Canin Cocker Adult is a nutritionally complete dog food especially designed for English or American cocker spaniels aged one year and older. This food is designed especially for cocker spaniels and the physiological needs of the breed. Royal Canin Cocker Adult contains an ingredient complex that helps to support the skin's natural barrier, reducing the chances of infection and irritation from outside sources. The added borage oil and biotin supports the natural glossy look of your pet's coats, keeping your dog looking fit and healthy. Antioxidants are added to support eye health, helping to reduce stress on the eyes and minimise the risk of vision loss. The recipe also includes ingredients that can help to maintain your cocker's organ health, specifically the heart muscle. For optimal oral health, Royal Canin's kibble keeps calcium in the saliva for longer. This reduces the risk of tartar build-up and helps to prevent cavities. nutritionally complete: can replace other dog food at every meal. Although regular dog food is fine, this recipe was designed with the nutritional needs of cocker spaniels in mind. You should switch to this food if you want to make sure your pet is getting all of the right vitamins and minerals that they need, along with the right level of protein and carbohydrates to support their overall health and ideal weight. This food is only recommended for cocker spaniels aged one year or older. If your dog is younger than that, you can start them on Royal Canin Junior Cocker. COMPOSITION: rice, maize,dehydrated poultry protein, maize gluten, animal fats,hydrolysed animalproteins, beet pulp, vegetable protein isolate*, fish oil, minerals,psylliumhusks and seeds, soya oil, fructo-oligo-saccharides, hydrolysed yeast (sourceofmanno-oligo-saccharides), borage oil (0.1%), green tea and grapeextracts(source of polyphenols), hydrolysed crustaceans(source of glucosamine),marigold extract (source of lutein), hydrolysed cartilage (source ofchondroitin). ADDITIVES (per kg): Nutritional additives:Vitamin A: 30900 IU,Vitamin D3: 800 IU, E1(Iron):49 mg, E2 (Iodine): 4.9 mg, E4(Copper): 9 mg, E5(Manganese): 64 mg,E6 (Zinc):192 mg, E8 (Selenium): 0.11 mg - Technologicaladditives: Pentasodium triphosphate:3.5 g -Preservatives - Antioxidants.ANALYTICAL CONSTITUENTS: Protein:25% -Fat content: 14% - Crude ash: 4.8% -Crudefibres: 1.4% - Per kg: Omega 3 fatty acids: 7.2 g including EPA & DHA: 4 g.*L.I.P. : protein selected for its very high assimilation. Lovely food As always, very good, quick service. My dog gets very excited when this parcel is delivered as she knows that it is her favourite food! My 5 year old cocker loves this and always clears the bowl. Her coat is lovely and her eyes are bright I wouldn't give her any other dried food. I have been a customer for few years my dog is eight now. I buy food medicines etc. I have never been disappointed Great prices, fantastic customer service and quick delivery I highly recommend. 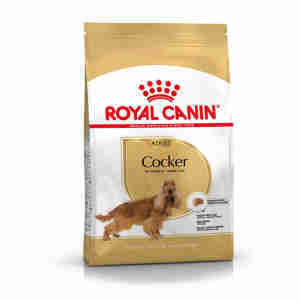 Royal Canin Cocker Spaniel Food used for 8 years, very satisfied.